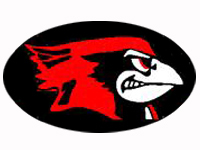 The Ell-Saline Cardinal varsity boys’ basketball squad snapped a four-game losing streak Thursday evening with a 72-65 victory over the Canton-Galva Eagles in the consolation semifinal round of the 45th Annual Canton-Galva Boys’ Basketball Tournament. Ell-Saline’s 1-3-1 half court trap defense forced nine Eagle turnovers in the first quarter, helping the Cardinals out to a 14-7 advantage after the opening period. From that point on, the Cardinal offense soared to heights not yet reached during the 2018-19 season, pouring in 25 second-quarter points, while adding 26 more in the third quarter to give Ell-Saline (3-8) a 65-39 advantage at the end of the third. Canton-Galva (3-9) stormed back with a furious fourth quarter rally, outscoring the Cardinals 26-7 in the final period, but the 26-point deficit was simply too much for the Eagles to overcome. Four Cardinals finished the contest in double figures, with junior guard Sawyer Kramer leading the way with a season-high 17 points. Sophomore Treyton Peterson poured in 16 points, while senior Pat Giersch and sophomore T.J. Morrical added 13 and 10 points, respectively. Junior Caleb Hammonds chipped in with nine points. Canton-Galva received a game-high 22-point performance from freshman Tyson Struber. Junior Kinser Colgin scored 15 points on the night, while sophomore Brayden Collins added ten. Ell-Saline will square off in the consolation final on Friday afternoon, renewing its rivalry with the Bennington Bulldogs. Bennington advanced Thursday with a 45-36 win against St. John’s Military School. The Cardinals and Bulldogs have already met twice this season. Bennington took the first matchup on December 7th in the Tri-County Classic, with Ell-Saline getting redemption with a victory in league play against the Bulldogs on December 18th.